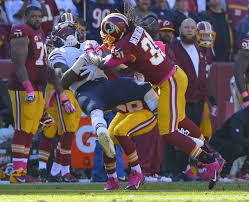 A couple of weeks ago, Washington Redskins safety Brandon Meriweather offended pretty much everyone in the NFL with his comments regarding tackling wide receivers. For brevity’s sake, Meriweather said that he would be targeting offensive players’ knees to avoid facing fines and suspensions for hits to the head. Brandon Meriweather (31) playing hard-nosed football. If this sounds cynical, well, it is. But it is also the result of years of rule changes and medical recommendations aimed at removing head injuries (and subsequent lawsuits, no doubt) from one of the world’s most violent games. The problem with this vague rule is that it leaves far too much to the referee’s interpretation, and does not take into account the actions of the ball carrier. For example, a juking running back or diving quarterback might expose his head to a tackle that was originally aimed at the waist. There have been many incidents this season where an unlucky defender, attempting to make a clean, hard tackle on a receiver or running back, accidentally made contact with the head and was flagged for a “dangerous tackle”. Ultimately, fans, coaches and players don’t want to sacrifice the rough physicality of NFL defense, but no one wants to see players suffer dangerous injuries, either. 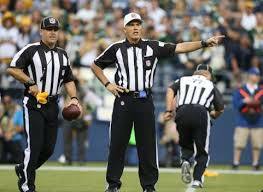 Meriweather, however, can not plead innocence on the two plays that resulted in the fines and one-game suspension. He is clearly targeting the heads of Bears’ receivers Alshon Jeffery and Brandon Marshall on these tackles, and was rightfully penalized on both. But the issue goes deeper than the Redskins’ defender. He is just one of a generation of defensive players who were taught, from middle school on up, to destroy a ball carrier in an effort to dislodge the football and create a fumble or incomplete pass. He also joined the league in 2007, at the height of the “Jacked Up!” era, wherein every week the Monday Night Football crew would replay the biggest, most destructive tackles of the past weekend. Headshots and other injurious tackles were put on display for the analysts, and the viewers, to watch and cheer and cringe all at the same time. Thankfully, this segment only lasted two seasons and was replaced with the much funnier “C’mon Man”, as concussion issues were beginning to come to the forefront of the media. But players are taught to hit, and hit hard, whenever possible. Why? My guess is that it’s partly strategic, partly intimidation. The strategy centres around the notion that a hard hit could jar the ball loose, resulting in a fumble and change of possession. Except, I’m not sure if that’s actually true. Here is a perfect example of a defensive player from the Chiefs dislodging the ball with a strip, rather than demolishing the Bills receiver with a tackle to the head or to the knees. Again on this Willis McGahee fumble, Ravens defensive tackle Pernell McPhee wraps McGahee with both arms, and manages to rip the ball from the running back’s hands. The only really big hits that result in fumbles are often blind side hits where the ball carrier does not have a chance to defend himself or protect the ball. Otherwise, a well positioned arm is more likely to remove the ball than a big hit. The wrap tackle is a forgotten art among young players. So why are some linebackers and safeties trying to injure offensive players with massive collisions when a simple tackle will do? Maybe it’s for intimidation. Coaches and players, from the youth system right on up to the pros, are looking to not just make tackles or create turnovers, but scare the opposition as well. To them, it’s not enough to tackle a running back, you have to also make him scared to run through the line at all. That wide receiver going across the middle should not just have to worry about catching the pass, but also about his head and knees as well. That may be enough to distract him or make him slow down or turn his head at the last second. I understand the desire to intimidate opponents, but NFL players can not be allowed to, and should not even entertain the thought of, attacking an opponent’s most vulnerable body parts. Obviously, interpersonal respect has started to become an issue in the league, even among teammates, and it could be an issue that the players’ union and the league might start addressing. Ndamukong Suh (90), known for stepping on opponents, among other things. So how can the league start addressing dirty hits, and the larger issue of respect among players? 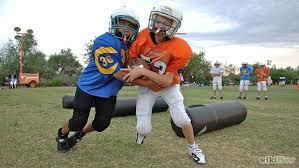 First, youth coaches should be encouraged by the NFL to teach kids to arm tackle and strip footballs to force fumbles, not to annihilate opponents with their full body weight at uncontrollable speeds. Secondly, the NFL may have to penalize repeat offenders (like Meriweather) with bigger suspensions, bigger fines and even team penalties, which may stop teams from signing those types of players in the future. The fact is, there will always be injuries in the game, but a shift toward accountability and respect will create a safer game for all involved. With some adaptions and a shift toward safe, respectful defense, we will start to see fewer head injuries, eventually. Leg and foot injuries, arm injuries, even knee injuries, can all be rehabilitated and players can return to form (Adrian Peterson has more than proven that, as will Derrick Rose in the NBA this season), but one serious head injury can do more than end a player’s career. As we have seen time and time again, it can end a person’s life. ← Ender’s Game Reviewed: Would You Like to Continue?